I dialed 150 and, after listening to a series of questions, pressing 4, listening to a further set of questions, pressing 4 again, and listing to further questions – this time pressing 2 – I asked them a question about three-way calling. I needed to know whther to set my recall button to ELR to TBR. However, the gentleman’s first question was; “Do you have a BT telephone”. I said it was an ATL phone. “Can’t help you” I was told, it wasn’t a BT phone. But, I said, my query was about a BT service, not about a non-BT telephone. But, alas, by then he had totally lost interest in my call. This is BTs idea of “Customer Service”. But it is not my idea. This boy is about two years old. Found and taken from Khao Lake Resort Area, the southern part of Thailand. His parents are missing. His nationality cannot be identified. Please take a look at the above picture of this victim from Tsunami. If you do not know him, please forward his pictures to your friends or organization in your country for further publication. Thanks to timely Internet postings, the 2-year-old boy pictured at right, Hannes Bergstroem, is now safe in the arms of his Swedish family. 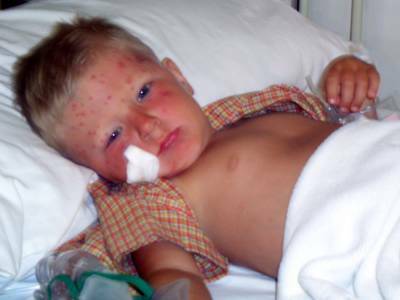 The photos were spotted on the Web by the child’s uncle, who rushed to Phuket International Hospital to collect him. The entire family, including Hannes’ father, mother, brother and grandparents, had been vacationing in southern Thailand when the December 26, 2004 tsunami struck. It looks like all the family survived. I hope so and that this is one of the stories that can still inspire others who have lost loved ones over there. Google set up “G-Mail” some time ago and said that as it is in Beta they didn’t want too many users so joining would be by introduction only. Initial screen – after signing in. 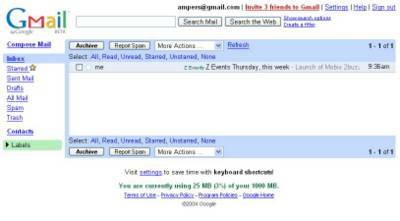 I have been using GMail for a month or so now and like it so much it has become my main e-mail communication client. Although I say “main”, it is the only one I use. However like most users I do have a back-up ISP just in case! The reason I have gone over to a web based e-mail is not because I can access it, and all my past e-mails, easily, from any computer with access to the Internet, anywhere in the world. It is not just because Google allow me a thousand megabytes of storage. It is not because it is totally free of charge. I prefer google because the site is lightening fast, and accessing it, reading my e-mails, answering them and doing any “contact” housekeeping is far faster than contacting an ISP, downloading mail, dealing with it and then uploading it to the ISP again. If you prefer, you can redirect your e-mail to another address, or pop3 directly to the site. I haven’t tried the later, but if you use the former you lose the use of their excellent spam filters. You can filter mail into sub-folders by any number of ways – and test the filter as you write it. You can use a filter to send e-mail to another address. This can be useful if you want to send e-mails from a specific person, or on a specific subject to your mobile. These are just the features that really interest me. The program, in fact, does an awful lot more but I won’t bore you with everything here! It is my considered opinion that the Beta will carry on for at least another year, or even longer. And the Invitational system must be excellent from Googles point of view. because not only does it create interest, but it allows them to gauge the disk usage of the average user and only send out invitations when Google increase their hard disk capacity. Well, whatever the reasons I am happier with this system that I have been with any other system. I ocassionally have invitations to give out – usually six or ten at a time. If any reader would like to put their name down for an invitation, e-mail me at ampers@gmail.com (see, I am not afraid of letting spammers see my e-mail because of the excellent way Google deals with spam). I will then issue an invitation when I have some spare – I have two spare at the moment. If you e-mail me, please put “Invitation – Yes” in the subject line and, if you get an invitation from someone else in the meantime, please e-mail me with “Invitation – No” in the subject line I will cancel your request as once I send it off, it is wasted if not used. 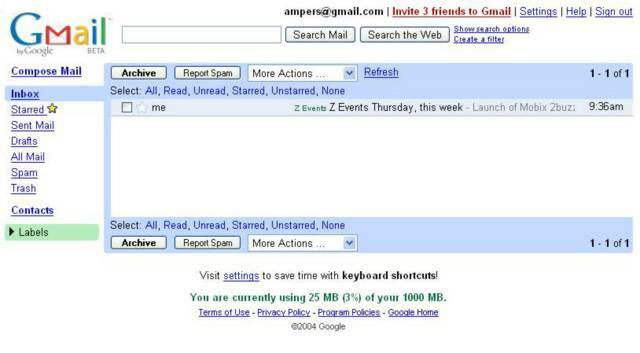 You can e-mail me from the link on the right-hand side-bar.